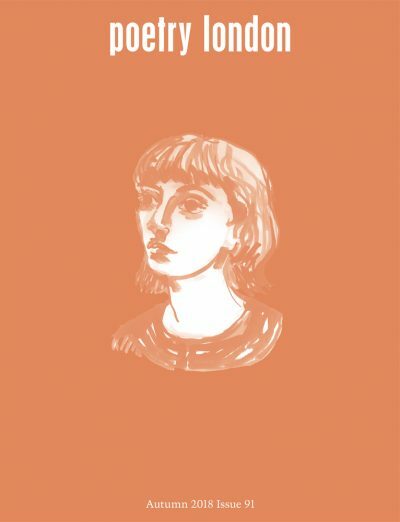 The Autumn 2018 issue features new poems from Rebecca Perry, Laura Elliott, David Harsent and Andrea Brady, as well as extracts from a new collaborative work between Vahni Capildeo and Chris McCabe, and the publication of poems from writer and visual artist Robert Herbert McClean’s filmwork Song for Ireland. The Autumn issue also includes poems from Poetry London Clore Prize winners Romalyn Ante, S K Kim, and Selima Hill. The issues essay, by Daisy Lafarge, presents a searching contribution to the debate about contemporary poetry and motherhood. Meanwhile Jess Cotton interviews the American poet and astrologer Ariana Reines, covering topics that range from intimacy to resistance, and our critics review new collections by Vahni Capildeo, Mark Ford, Richard Scott, Tishani Doshi, Amy Key and many more.